Amber was the capital of the Kachhawaha clan preceding Jaipur. It is placed at a distance of 11 km from Jaipur city. This fort was built by Raja Man Singh I. built in the year 1952, this hall highlights the wonderful carvings and minute mirror work. The Amber Fort has several halls and pavilions with their own specific alluring attractions. 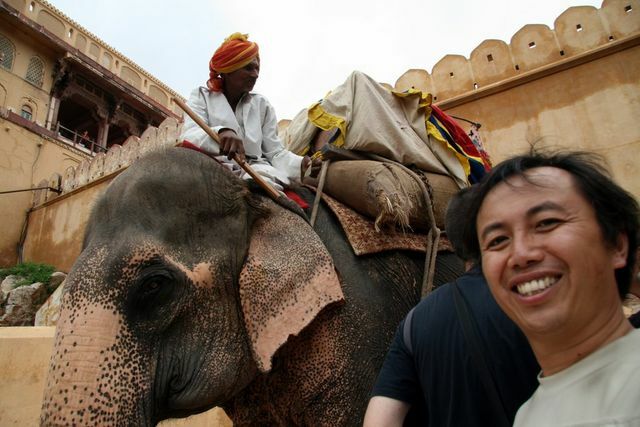 The best part of this Fort for tourist attraction is that it is located on a crafty hill and the royal elephant ride. Amer Fort is the part of traditional Jaipur and its royalty. Without a visit to Amber Fort, a trip to Jaipur would be definitely incomplete. Amber was originally built by the Meenas. Amer is located at a very high hill which makes this fort hard to access via foot but to help the tourists there are various transportation facilities provided at Amer fort. The major segmentation of the fort comprises ladies apartment, army area, courtyard, temple and palace. An stunning building in white marble and sandstone, some rooms are covered with thousands of tiny mirrors and coloured glasses. An intricate artwork, a hallmark of Indian Palaces. To reach Amber Fort from anywhere in Jaipur you can hire a taxi or a car. This will your journey more convenient. The public bus to Amber starts at Ajmeri Gate and MI Road which will take around twenty minutes to reach to Amber Fort. The most exciting part of the Amer fort visit is to go on the top of the hill by the elephant ride , which is accessible for the visitors. Riding an elephant uphill seems a cliche for tourists. But it really helps feeling the ambience and plunging deeper in India. The elephant ride offers a skyline view of the Pink city and a mesmerizing sight over Maotha Lake. We can choose a guide to assist, or an audio guide is even a good option which is available at the doorstep of the fort. To make your trip more spectacular and memorable one, elephant safari will be the best and it provides a royal feeling as well. It will take around 15-20 minutes if we prefer to go on foot rather than hiring an elephant.If you hire a guide then it will be much better as he will show you around the fort, as there are many interesting places here which can be easily missed. They will give you a quick tour around the Fort, and you most likely wants to walk around for a while longer by yourself. The shade of the fort transforms seemingly as the sun sets. In the night as well the fort comes alive with adorable decorative lights. It is built over the remaining of traditional structure.